Today marks my second week using the Medifast 5 & 1 Plan (5 Medifast meal replacements and 1 homemade "Lean & Green" dinner each day). I started out two weeks ago weighing 234 pounds. The first week, I lost 6 pounds (228). This week, I lost 3 more pounds (225). I am *very* pleased with that. Nine pounds in half a month! One thing I wanted to clarify because there have been a few comments on my menus, stating that having just a Chai Latte for breakfast or just a bar for a snack would not be enough. Wondering if I am hungry. I am not generally hungry. Each of these Medifast meals is a meal replacement. It might seem like a cup of Chai or Hot Cocoa would leave on famished, but when it contains something like 14g of protein and 4 g of fiber, it is pretty filling and satisfying. Each 'meal' is supposed to keep me full for 2-3 hours; eating so frequently leaves me not feeling deprived. And all the meals are interchangeable so I can have chili, soup, a Peanut Butter bar, a shake, pretzels, or a Cappuccino and get basically the same nutrition (high protein, low sugar, low to moderate carbs). And if I have a very hungry day I can borrow part of my dinner and eat it earlier in the day (which is nice when you get such a large portion, such as 2 cups of Egg Beaters or 7 ounces of fish along with 3 servings of vegetables). I wanted to share the dinners I had for the last two evenings. 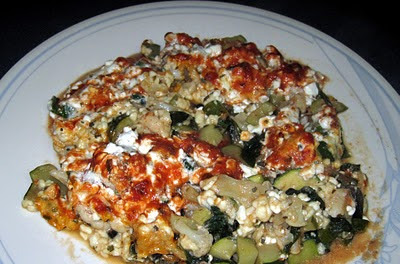 First, I made a 'Lasagna Plate' which was inspired by the zucchini lasagna I made last week. This time, I just sauteed a bunch of chopped vegetables, including zucchini, spinach, and cauliflower. I placed that in a dish and topped it with a mixture of 2% cottage cheese mixed with shredded mozzarella and Italian seasoning. Over that I put 1/4 c of no-sugar-added pizza sauce. I baked it until it was hot and bubbly. It was yummy! 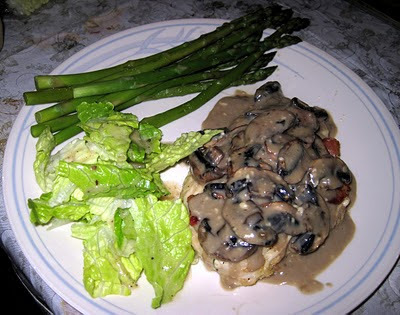 Last night I made something that I saw on a message board: Alice Springs Chicken. I took a 7-oz chicken breast, pounded it thinner, seasoned with pepper and garlic powder, and baked until done. Then I brushed it lightly with a mixture of light mayo and Dijon mustard. On top of that I put a slice of (lean, 40-calorie) bacon, and over that I put a sauce made from chicken broth, Laughing Cow Light swiss cheese, and sliced mushrooms. It was fantastic! I made this for the whole family, with sides of Caesar salad, steamed asparagus, and roasted red potatoes (I had no potatoes). I do not feel deprived and I am enjoying the way I am eating. I feel good and am going to start adding in more exercise this week (walking, biking, and strength training). Just an aside. The weight I am now... 225 pounds... has been a regular sticking point for me. I have gone up and down between 225 and 235 for most of the last 18 months. In fact, the last time I got below 225 was in mid-December 2008. That's a long time. So when I see 224, I will be so excited to have broken through that crazy sticking point! Soon, I hope. Lyn, You're making excellent progress! I'll bet it'll feel great when you blow through that sticking point of 225. I definitely hope next weigh in gets you another couple pounds! I am sure that you're not hungry on the medifast plan but I wonder if they change it based on age and size. Being younger and more active than you are would definitely make me hungrier on what seems like so little food, even if it does have fiber and protein. It definitely seems nice to not have to think about planning and such though. The snacks being layed out seems so much easier! They don't usually change the plan based on age or size, but I know that the dieticians sometimes recommend people who are super active or athletic or diabetic do a 4 & 2 Plan (4 Medifast meals, 2 Lean & Greens). That's terrific Liz! Keep it up. You are inspiring me to keep going and to meet my goal! I'm so happy for you Lyn! Your gourmet cooking skills are paying off, too! Those meals look yummy and I'm positive they are making it easier for you to stick with this plan. Keep up the great work! WTG on your second week. You are inspiring me to start back. I did MF for two weeks and started to feel like my short term memory was gone. I read some scary stuff about low carb diets affecting memory and I quit MF that day. Have you seen this problem at all? I have all the MF stuff still and aside from memory issues, I was doing fine! I have read that because your brain is used to quickly grabbing simple sugars as fuel, it takes a few days for it to start using other nutrients as fuel because the sugars are no longer easily available. I felt a little "foggy" for about 3 days and started to worry a bit (forgetting little things) but then it went away and I feel completely normal. If I started having memory problems or not feeling right *after* that transition period I would probably stop Medifast. Wow! I really love the look of that lasagna plate! I'm so stealing that! Lyn I think I am going to try this with you. At least for a month or so.Seems like you are doing so great with it! Good job! It's great that you're enjoying the plan. That lasagna plate looks so yummy as does the chicken. Thanks for sharing. Great job on the loss! You are inspiring. Your lasagne plate is one I'll copy. You'll have to let me know how much the medifast costs when you aren't getting it for free! Mmm, I LOVE your recipes! They always look so yummy but easy (which is something that I am ALWAYS looking for). It costs about $300/month. I've seen people say they use coupons or get a free week to get it a little cheaper. Good luck breaking through the 225 barrier! I know you can do it!! Wow, you're just smoking that scale, Lyn! Thanks so much for sharing your process and that recipes was yummers--will definitely try it. That your family can eat what you're making too is pretty cool. Congrats on the loss. I'm glad it's going so well and that you seem to be enjoying the foods for the most part too. You are doing great. You are going to blow right past 225 next week, especially adding back in some more exercise. Keep up the great work..
Oh and that lasagna plate looks soooo YUMMY! I'm definately going to have to try that myself. 225 was my hovering point for a while too. I know you can get past it and stay past it! And every time you go down a pant size get rid of them. Dont put them in a box where you can go get find where you hid them...GET RID OF THEM!!! Then there isnt an option to go back to them. And who likes to go out and buy bigger clothes? Keep up the great work. You are an inspiration to many. That lasagna plate looks awesome! Your posts are always so inspiring. I'm going to look through your recipes & give some a try. Can't wait for you to get past 225! You are making great progress. Hope to see you break through 225 soon! Lyn--don't get rid of your bigger clothes..I listened to that advice from WW and have regretted it. Getting rid of larger sizes is no guarantee you won't regain. It's more likely you'll end up having to put out more cash or be miserable in too tight clothes. The odds are against all of us who lose weight...we likely will regain. Why suffer on two counts? Congrats on your progress! Sounds like the structure of Medifast is really helping you. It's going to be fantastic to wave goodbye to 225! Excellent! See ya next week on the other side of 225! I had a break down moment this morning when I gained on the scale. I freaked out then calmed down remembering several of your posts where you chugged through it. This is usually where I give up but this time is different, I will keep going. Thank you for this blog and keeping it real! I also have a zone that I have a difficult time passing. I've been hovering around the same 3 lbs for 7 weeks. I can't get under it. I love your meals-they make my stomach growl! Can't wait to see next weeks weigh in! !